HOPKINTON - George V. Brown was greeted by royalty and presidents. He wore floppy hats and had a booming bass voice, lived his entire life at Maplewood Farm on Hayden Rowe Street, and as athletic director of the Boston Athletic Association started a family tradition at the 1905 Boston Marathon. On that spring day in Ashland, Brown fired the starter's pistol and sent the runners on their way to Boston. He performed the same duty every year until his death at age 57. The mantle then passed to Brown's four sons, who continued the family's annual rite of spring; it currently rests with his grandson, Walter F. Brown. The Plainfield, Vt., resident wears his grandfather's 1937 starter's ribbon for the occasion. Now, though, George V. Brown is again standing proudly, a fedora on his head and a pistol in hand. Thanks to the efforts of the Hopkinton Athletic Association and the Brown family, a life-size bronze statue of the patriarch was unveiled on Sunday during the MetroWest Symphony Orchestra's Marathon Week kickoff concert at Hopkinton Middle School. The statue, sculpted by town resident Michael Alfano, is on display at Hopkinton Common. "It's hard to believe I've been firing the starter's pistol [for 17 years]," said Walter F., a former member of the BAA's board of governors, "and every year l feel a sense of excitement because of the energy in Hopkinton. It always makes me think of my dad, uncles, and grandfather, and our special connection." The Brown family tradition was interrupted only once, in 1990, when BAA president Francis L. Swift was the official starter. Alfano collaborated on the statue effort with the Hopkinton Athletic Association's president, Tim Kilduff, and Tom Burke, a grandson of George V. Brown and one of more than 50 family members who attended the unveiling. The sculpture was funded through a state economic stimulus grant administered by the Hopkinton Athletic Association. Inspired by his two-year project, Alfano has qualified for this year's 112th Boston Marathon, and will be a member of the Melanoma Foundation of New England's Running for Cover team on Monday. "Studying George V. Brown was like peeling an onion; there were so many amazing layers," said Alfano. "A century later, the events he had a hand in are still going strong. I hope my sculpture will be as revered a hundred years from now." As BAA athletic director, Brown moved the marathon's starting line from Ashland to Hopkinton in 1924 to conform to the Olympic distance - 26 miles 385 yards. An assistant coach for several US Olympic track teams, Brown named one of his prize bulls Lord Burghley in honor of the 1928 gold medal-winning hurdler David Burghley of Great Britain. Although George V. Brown's house still stands, no family members remain in Hopkinton. The site of Maplewood Farm, once one of the largest dairy operations in Middlesex County, is now a residential neighborhood. And yet, said the BAA's executive director, Guy Morse, "there is no more appropriate place to honor George and his descendants than Hopkinton." Brown's four sons are deceased. Walter A. Brown, who succeeded his father as manager of Boston Garden, was the original owner of the Celtics, president of the Bruins, and BAA president from 1941 to 1964. Thomas J. Brown served as BAA president from 1982 to 1985 and was postmaster in Hopkinton, where the main Post Office bears his name. Paul V. Brown managed Boston Arena and the Bangor (Maine) Auditorium. 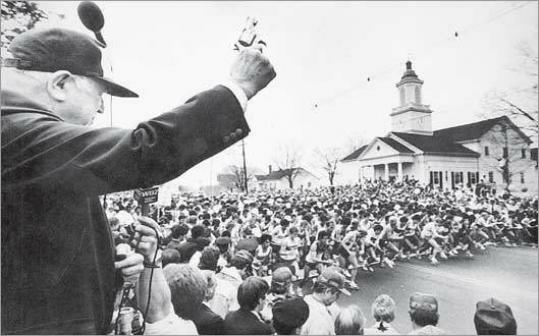 George V. Brown Jr., the father of this year's starter, was a Brookline selectman and chairman of the statewide organization of selectmen, and helped organize security and logistics along the Marathon route. Thomas W. Whelton, Walter A. Brown's son-in-law, was BAA president from 1990 to 1994 and is on its board of governors. "Tom Brown's stories, told to me in the living room of the farmhouse at 200 Hayden Rowe, were the foundation of my commitment to one day tell about the Brown family influence on sports at the regional, national, and international levels in a tangible way," said Kilduff. "The Brown men were dedicated to the promotion of both amateur and professional sports, so it is a privilege to reintroduce the story of the contributions of their patriarch through the statue of George V. Brown." Said Jack Riley, a Medford native and coach of the 1960 gold-medal US Olympic hockey team: "My brother Billy and I had season tickets to the Bruins, and we'd stand in the east lobby of the Boston Garden to get the players' autographs. George Brown and his son Walter always made sure we were taken care of." Years later, Riley's appointment as coach of the team that upset the Soviets in Squaw Valley, Calif., resulted from Walter A. Brown's influence as chairman of the US Olympic Ice Hockey Committee. "George and Walter were caring, fantastic people, and Walter became a lifelong friend. He was Mr. Hockey," said Riley, who now lives on Cape Cod. "I definitely had great connections for getting on the press bus to watch the Boston Marathon." The BAA fell on hard times during the Depression, closing its original clubhouse at the corner of Exeter and Boylston streets and auctioning its furnishings. George V. Brown successfully bid on the crockery, kitchen pans, bar crystal, and pantryware, which he stored in his barn, cellar, and attic. "I grew up eating my cereal from one of the BAA-inscribed bowls," said Burke, a West Roxbury resident who spent the first five years of his life at 200 Hayden Rowe St. "That the folks of Hopkinton have embraced so warmly the idea of erecting a statue of him is a thrill for our family. Honoring George V. Brown is a wonderful and emphatic declaration by Hopkinton - about itself and what it holds dear."